Kontsina - thanoscardgamess jimdo page! This is a suite of three related games played in Greece, Bulgaria, Uzbekistan and Tajikistan, which are Koltsina (or kontsina), Khol and Pirra. Kontsina is a popular fishing-style game from Greece that usually grandparents teach to their grandchildren. A regular 52 card deck is used. Each numeral card (ace-ten) is counted as its numerical value (ace = 1, two = 2, etc). Court cards do not have a numeric value. 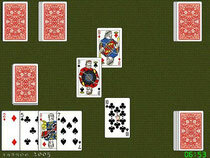 The aim is to capture cards from a layout on the table, by playing a card from hand which matches in number a table card or the sum of several table cards. Picked up cards are accumulated in a pile to be counted at the end of the round. Khol and Pirra differ in terms of target score to achieve a win. You have the option to select among various card decks and you may play either alone against one computer opponent, or in a partnership, 4-player game, with a computer partner. The absence of any sweep feature and card builds makes this card game very easy to learn and play. If you are new to fishing games you may start here!